Don’t blow it! Radiators must have good air flow to work effectively, so it’s vital that high quality, high air flow fans are used when you need maximum cooling. We offer high quality electric fans to suit any performance car application, including street car, 4x4, track, off-road racing, drag, drift, burnout and towing. Choosing the right fan(s) is not always a simple process. Too much or too little air flow can reduce cooling effectiveness. If you need help selecting the best fan for your application, send us an online enquiry or call during business hours. Maradyne is famous for using only the highest quality components in their fan assemblies. Plastic components are moulded out of 100% glass-filled nylon with no polypropylene fillers or blends. Motors are designed for long life, durability and to withstand harsh environments. These motors perform not only on the race track but also in extreme off-road racing conditions. Maradyne performance test their products at their in-house air test chamber, which ensures reliability of ratings. Maradyne fans are found on race cars, dragsters, hot rods, street rods, off-road vehicles, mobile generator sets, military vehicles, buses, golf carts and other specialty applications. Adrad Performance offers a comprehensive range of High Performance Maradyne fans from 10"- 16", including the Mach 1, Mach 2 assemblies as well as the Jetstream platinum 2 series 3100 cfm assembly. 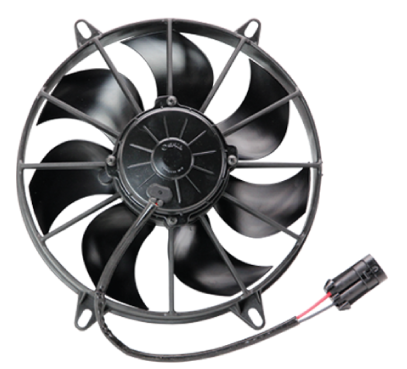 Established in 1959, Spal are recognised as leaders in design and manufacturing of electric cooling fans delivering high performing, reliable and superior products for automotive and motorsport applications. Spal fans are fitted as factory original equipment by vehicle manufacturers including Audi, BMW, Caterham and Harley Davidson and are used by motor racing by teams including M-Sport WRC and Prodrive. 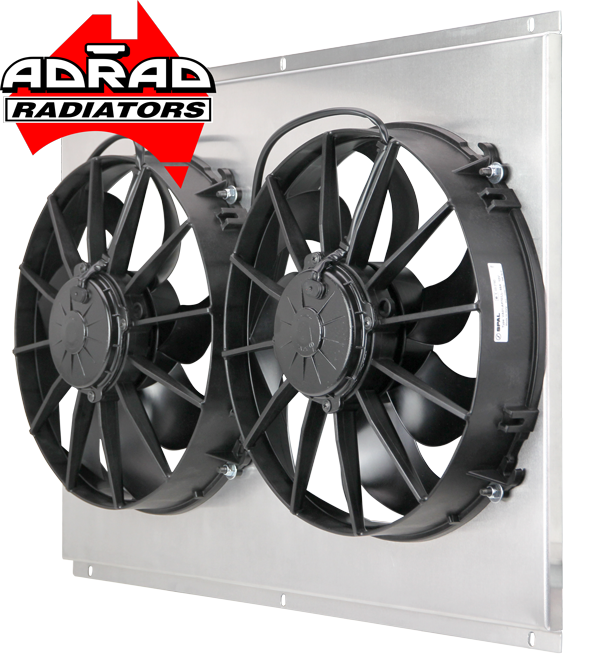 Adrad Performance offers High Performance SPAL fans in sizes ranging from 4” - 16” with air volume movement from 147 cfm up to 3000 cfm racing fans. Manufacturing OE and aftermarket heat exchange products since it's foundation in 1985, Adrad has established itself as Australia's number one radiator supplier through it's relentless focus on providing the highest quality products as well as developing and using the latest cooling technologies. Adrad's in-house team of engineers design parts using the latest software and equipment and have access to the Adrad Group's world class testing facilities. Adrad have worked with motor racing teams competing in categories inlcuding Virgin Australian Supercars, Dakar Rally, American Formula Drift and World Series Sprint Cars.